"I've gone from the bottom of my math class to one of the top students in my math class! Thank you Mathnasium of Redmond for helping me get caught up!" "I asked my parents if I could come back to Mathnasium this year because you all help me understand the math better!" 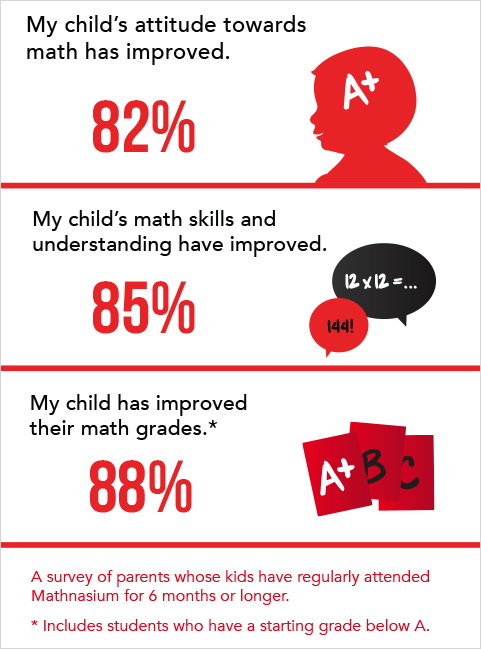 "Our favorite things about Mathnasium are the great Instructors and the constant feedback and involvement in our son's progress. We appreciate the professionalism of the entire staff!" "Mathnasium is great! What can I say, our kids finally enjoy doing their math homework and best of all, it has boosted their confidence in class as well. The staff here is really good, they know their stuff and give the kids enough attention, while letting them work out the problems on their own. If you have thought about trying Mathnasium for your kids...don't wait any longer...just do it. You won't regret it. Thanks MATHNASIUM!" "Our son had an interest in Maths. A couple of years ago, we enrolled him. It has been fantastic. They teach each student in a method that they will understand - I wish I had that tutoring style when I was growing up.Our son is very happy and a grade level ahead in Maths. In his first MSP tests - he got above 90% in Maths exam. We did practice with our son at home too, giving him past exam papers to practice. Mathnasium works with schools too - so the Math teachers in both school and Mathnasium can communicate via email or the child's parents to be on top of the child's Maths skills. It is great for us - we get a date night here and there - it is a win-win for all parties! Maths is a great subject for life, especially, if a child gets the subject at a very early age. Thank you Mathnasium!"